For Butler, it may have been an early indication that he’s ready to take on a bigger role this coming season. With the departure of Ronnie Brewer and Kyle Korver, it’s an opportunity he’s talked openly about embracing. In recording three 20+ point games during summer league play, he let his play speak for itself. Assistant coach Adrian Griffin, who served as the summer league squad’s head coach, was quick to praise Butler for his work ethic this offseason. As for what kind of role Butler may fulfill, Griffin envisions him as a player who will come in to games, defend, and provide a little extra intensity and energy. Thomas, on the other hand, hopes that his summer league effort was enough to help secure a full time spot on an NBA roster. Last season, the 6-9, 225-pound forward played in three games for the San Antonio Spurs, while splitting time among three teams in the NBA Developmental League. While it seems likely Thomas will be invited to some team’s training camp, landing a full-time spot remains to be seen. But, Griffin says, Thomas has what it takes to do just that. 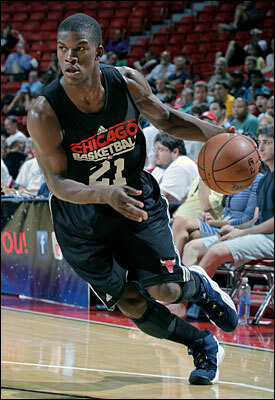 Griffin also liked what he saw in Marquis Teague, whom the Bulls drafted with the 29th pick in the 2012 NBA Draft. Teague averaged 10.6 points, 3.0 assists and 1.4 rebounds per game. And though he didn’t shoot the ball particularly well, converting only 29.4 percent of his attempts from the field, Griffin was impressed by the way the 19-year old rookie bounced back from a rough summer league debut. Indeed, Teague’s best statistical outing came in Chicago’s second contest, when he finished with 14 points on six of 13 shooting to go with five assists. One other intriguing player for the Bulls this summer was Leon Powe, a 6-8, 240-pound power forward with five seasons of NBA experience. Though injuries have sidetracked Powe and he didn’t play in the league last season, his familiarity with Bulls coach Tom Thibodeau from his days with the Boston Celtics could prove to be an asset when it comes down to his chances at landing on a team’s training camp roster. Powe started all five of Chicago’s summer league games, but he never played more than 15 minutes per outing. Still, he finished with averages of 4.6 points and 3.6 rebounds per game, with is best performance coming against the Rockets, when he recorded nine points and six rebounds. All in all, if developing Butler and Teague was a primary goal of the Bulls this summer, they got what they wanted. Butler showed he’s on the path to earning some additional playing time, while Teague showed he’s able to bounce back from a less than stellar game. As Griffin stressed, both players will need to continue their hard work to further their development.